Fast food-themed Black Sabbath parody kings Mac Sabbath are about to kick off another North American tour, beginning October 27 in Pomona, CA at Lagunitas Beer Circus! In celebration of the tour, the band have released their second recorded song, “Sweet Beef”, along with a brand new, zany music video for the track. The music video features maniacal marionettes in the image of the band members themselves! 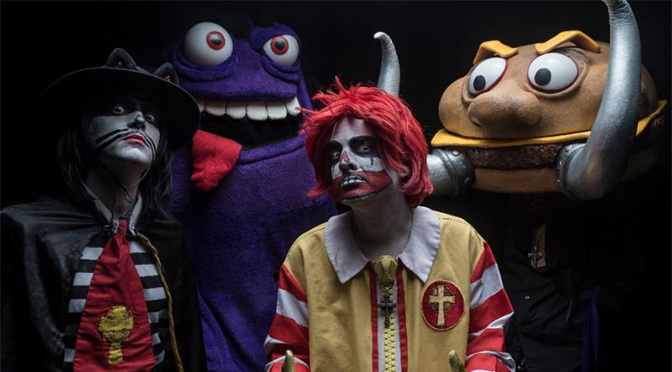 The “Sweet Beef” video concept was created by Mac Sabbath, Michael Serwich and Matt Scott, with maroniettes managed by Matt Scott and Rasputin’s Marionettes and editing and effects by Joe Seafus. Mixing raucous comedy with borderline-horrific theatrics, the only thing more petrifying than impending health problems resulting from years of overeating is a Mac Sabbath show. Show attendees should be prepared to partake in the fun – Mac Sabbath puts on a theatrical, multimedia stage show – complete with a smoking grill, laser-eyed clowns, bouncing burgers and many more magical surprises… basically anything and everything an unwary show-goer could ever want in their wildest dreams. Named by Buzzfeed as one of the “13 Metal Bands You Didn’t Know How to React To” + Named as LA’s “Best Tribute Band” by LA Weekly. Los Angeles, CA – Today, The Faim have partnered with Billboard to premiere the official video for “Summer Is A Curse,” the third single from their forthcoming debut album. Watch it exclusively HERE. The highly-anticipated new video follows frontman Josh Raven and his love interest on the run from the law, eventually escaping before it all goes up in flames. It also showcases the band delivering a stellar live performance with the Welsh countryside as a fitting backdrop. Fans can stream and purchase “Summer Is A Curse” HERE. Although the Aussie four-piece only started touring a few months ago, they recently played their 50th show at the legendary Download Festival in the U.K. Following tours with Lower Than Atlantis, Sleeping With Sirens, PVMNTS, The Dangerous Summer, and PVRIS, The Faim will support Sum 41 and Waterparks in August for a run of dates across Germany, the Netherlands, and Switzerland. The four-piece will also return to the U.K. in August to play the esteemed Reading & Leeds festivals. Tickets to all shows are available HERE.